It's not enough worrying about stragglers from a zombie herd crossing the road in front of you. Here on the island anything goes. Today, two squirrels scampered across in front of us, one from each side, involving us in a precarious slalom. But, wonder of wonders, neither of them stopped and turned round the other way at the last minute. "It's the survival of the most intelligent here", hubby said. Earlier there was another procession. Ibises. 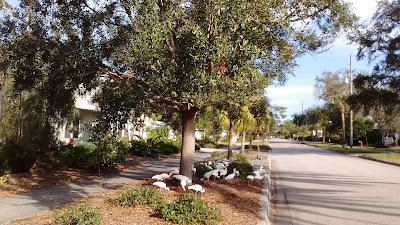 A whole flock of them, nosing around with their bright orange curved beaks. Periodically they descend on our roads, gardens and roofs. Here they are, safely on the the other side. In some parts of England it would be ducklings.